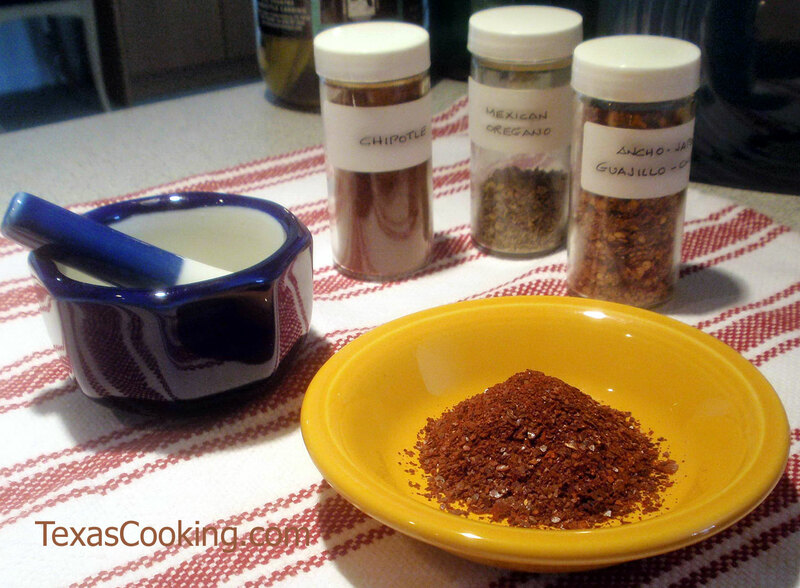 June may seem an unlikely month to present a how-to piece on making your own chili powder. Sure, there are lots of us who love chili year round, but many people really don't think about chili, especially making it, until the heat of summer has tapered off, and a nip is in the air. When it comes to something as seemingly superfluous as making your own chili powder, after the McCormick people have gone to the trouble of putting all those little bottles of chili powder on the supermarket shelf, you need some lead time to turn the whole idea over in your mind. I'm not going to spend much time talking you into it. It's not hard to do. You don't need any special equipment. It's fun. And you end up with an incredibly good, fresh, unadulterated chili powder that will (excuse me, McCormick) put all those little bottles to shame. Not only that but, once you learn how to turn dried chiles into chili powder, you can keep a stock of your favorite chiles on hand to use whenever you wish, even if you live in an area where chiles are not readily available. Remove stems and seeds from all the chiles. Cut each chile in half with scissors and flatten the pieces. Incidentally, good dried chiles will still have some moisture in them and be fairly pliable. Don't use dried chiles that are so dry and fragile that they shatter when touched. Chile ristras and wreaths are wonderful decorative accents, but the chiles dry out and lose their flavor. Put the chiles in a single layer on a baking sheet and bake for 4 or 5 minutes. Remove the pan and check the chiles (they cool almost immediately). The smaller chiles will be toasted first, so remove them and set aside. Bake the larger pieces another 4 minutes and check again. The poblanos will be done last, but as portions of them toast, break them off and set aside returning the pan to the oven if necessary. When all chiles are toasted and crispy, break each piece into two or three pieces and place in a blender. Pulse briefly until you have powder. Toast the cumin seeds by placing them in a dry skillet over medium heat. Stir the seeds constantly being very careful not to let them scorch. When they are a few shades darker than the untoasted seeds, they are ready. Grind the toasted seeds with a mortar and pestle or with a rolling pin between two sheets of waxed paper. Add the ground cumin, garlic powder and oregano to the ground chiles in the blender. Pulse a few more times to thoroughly mix the powder, and you're through. You should have about 1 cup of chili powder, depending upon the size of your chiles. You have created your own custom blend of chili powder. If you compare what you have just made with the store-bought variety, you will find it to be much darker in color with a deeper, richer aroma and taste. Naturally, you will want to test your creation, and an excellent recipe for doing so is the Brazos River Chili in Grandma's Cookbook, or any good recipe that relies heavily on chili powder. Store your chili powder in a small, airtight container. This recipe makes very good chili powder, but is by no means written in stone. The chiles and other ingredients can be varied according to your taste. To add the smoky heat of chipoltes (smoked jalapeos), for instance, substitute a chipolte for one of the chiles de arbol. Or better yet, toast some chipoltes and make a pure chipolte powder from them. A teaspoon of chipolte powder is the rough equivalent of one chipolte chile. With this knowledge, you are limited only by your imagination and your taste. Also, find out where to buy chili powder.